Although my heart and soul thrives thanks to my passion for bridal and beauty makeup, October is the time when I get to play every year. Halloween provides the opportunity to go all out and create everything, ranging from over-the-top glamorous to down-right frightening. 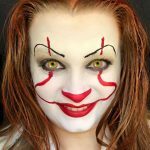 Here are a few new looks … [Read more...] about Halloween Makeup 2017!